IPC Infrastructure Preservation Corporation has developed a line of robotic infrastructure inspection services that give better and more accurate visibility as to deterioration so that the DOT’s can make the right choices with appropriating their limited funds for their massive infrastructure issues. Tampa, FL, January 29, 2017 --(PR.com)-- IPC "Infrastructure Preservation Corporation" a company that has updated 50 year old manual transportation infrastructure inspections with robotics, was invited to present the first robotic transportation infrastructure inspections to the Transportation Research Board this week in Washington, DC at their annual conference. These robotic inspection services will bring the Transportation inspection industry into the 21st industry and update current inspection methods to locate early stage deterioration and make repairs early in an assets lifecycle. Finding deterioration early in an infrastructure assets life cycle allows for repairs to be made early and can help safely extend the service life of these assets. Doing so can also help avoid untimely replacements saving billions in infrastructure costs. By utilizing IPC’s robotic inspection services, inspectors will be able to perform their services in a safer environment. Inspections done at night in many states, will be able to be performed during the day. There will no longer be a need to close lanes or park a 180-foot bucket truck on a bridge. IPC's tools and analytics themselves provide unprecedented accuracy and visibility to our DOT customers and will help extend the life of our valuable infrastructure assets. “Parking a bucket truck on a bridge at night with lane closures exposes the public to an unsafe environment. The inspectors are doing the best job they can with the tools they currently have. 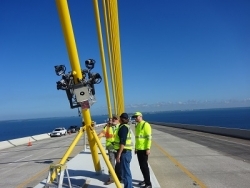 IPC’s robotic inspection systems brings a better tool to the marketplace, thereby producing better results,” says Bill Seavey, CEO of Infrastructure Preservation Corporation. “The same holds true for other inspection methods that were implemented years ago and have not been updated to utilize current technology.” Given the state of the nations infrastructure it would make sense to start utilize modern early stage deterioration detection technology as a tool to detect and repair concrete and steel structures. DOT’s see the benefit of replacing these night time inspection methods with IPC’s robotic inspection systems. With the importance of infrastructure and how it affects our economy and ability to compete in world markets, it is important to use the transportation funds in the most efficient manner possible. This would include conducting inspections with quantitative data that can be used to schedule repairs to extend the service life of these critical infrastructure assets. IPC uses nondestructive testing technology to assess today's infrastructure using the latest in modern and robotic technology packaged into a complete inspection service. IPC provides these services along with the required deliverable s within the DOT’s current budget. This allows DOT's to utilize IPC's technology and save billions in untimely replacements of infrastructure assets that have not been maintained properly. IPC’s combination of skills, patented tools and experience mean federal, state and municipal governments will not only save money but have the detailed data required to help with scheduling and budgeting in order to keep valuable infrastructure assets safe for the public.